Fresh/Raw: Serve sticks or thin rounds with your favorite dip, or grate and toss in a salad. Bake/Roast: Prick the skin of whole sweet potatoes several times with a fork. Bake until tender. Depending on size and oven temperature, whole sweet potatoes take 45 - 60 minutes; cubes or sticks take 20 - 30 minutes. Microwave: Prick the skin of whole sweet potatoes several times. Microwave on high until tender, 5 to 8 minutes for whole sweet potatoes depending on size and amount. Steam: Steam in a basket over boiling water until tender, about 40 - 50 minutes for whole sweet potatoes and 15 -30 minutes for cubes. 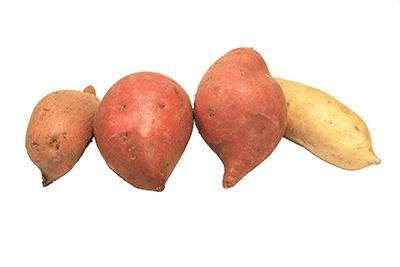 Boil: Cook in boiling water until tender, about 35 - 40 minutes for whole sweet potatoes and 12 minutes for cubes. Sauté: Peel and slice or cube. Sauté in a small amount of oil until tender, about 10 minutes. Grill: Slice lengthwise into halves or thick slices. Grill until tender, turning once.